For modern fleets there should be no compromise on safety as it is now possible to achieve higher levels of driver safety without the cost of buying up on fleet vehicles. Across the sometimes frighteningly broad range of vehicle options available in South Africa – both passenger and commercial – specification levels and add-on manufacturer options often present a bewildering array of choices. However, worldwide demand for increased levels of safety standards has meant huge strides forward in providing drivers with both passive and active levels of assistance to mitigate or prevent crashes. Sadly, some of the more important technology is currently available only in high-end or higher priced vehicles that may not be within the budget plans of many fleet managers. Moreover, considering the volatile Rand and equally changeable fuel price, these managers remain under massive pressure to keep costs contained. Features such as Forward Collision Warning, Lane Departure Warning and Pedestrian Collision Warning are now available in SA as aftermarket fitment items and are suitable for passenger cars, trucks and buses. The EyeZon iGoMDAS-9 Premium helps drivers avoid collisions with computer vision image processing technology, and is available locally through ITS South Africa under the EyeZon iGoADAS brand. • Forward Collision Warning (FCW) recognises various vehicles, such as passenger cars, trucks and buses and provides reliable FCW application in daytime and night time with Time-To-Collision (TTC) notification. • Lane Departure Warning (LDW) recognises various lane markings such as solid, double, and dashed markings and can differentiate lane colours such as red, white, yellow and blue. • Pedestrian Collision Warning (PCW) recognises pedestrians, cyclists and motor cycles. Additionally EyeZon iGoMDAS-9 Premium supports RS-232/CAN integration capabilities to a telematics device or modem in order to transmit driving data, including warning events to the backend server for analysis. 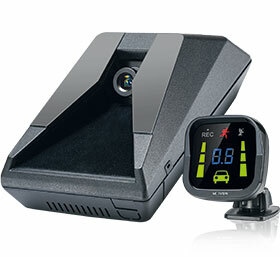 The installation is made simple as it connects via OBDII, CAN Bus or through a hard-wired analogue connection to the vehicle, while product calibration is done via Wi-Fi on an Android EyeZon iGoMDAS app. The iGoMDAS-9 is the latest product release to combine all the FCW and LDW features, but also includes an advanced PCW algorithm, telematics integration, dual video channel recordings and driver display indicator options. EyeZon iGoMDAS-9 Premium complies fully with the EU - LDW and FCW standard and has ISO, FCC and CE approvals. Accepting the assistance of technology to mitigate the imperfect driving behaviour of gullible human beings should make perfect sense for most drivers? As the saying goes, “A little bit of prevention is worth a huge amount of cure”. The system costs in the region of R7 995 excl. VAT installed, while rental or finance options are available from the Wesbank Webshop.